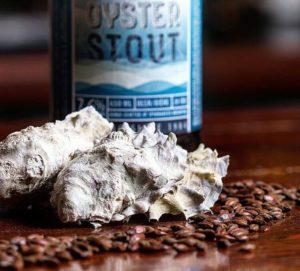 The Hollie Wood Oyster Stout is back and is one of our favourites to brew, with dozens of oysters per batch. The oysters are supplied from our friends Greg and Hollie Wood of Hollie Wood Oysters. The oysters are added throughout the brewing process, to the Mash, the Boil, and the Hop Back. This adds a rich, creamy body and briny minerality on top of a bold malt backbone. The boiled oysters are then shucked and served, shown here enjoyed in our brewery from the first batch of the year. Our brewers added a little mash and grain from the brew back into the shell for a delectable taste. If you like Spinnakers Gastro Brewpub why not check in via Untappd.